Amith Garments CROCKMETER MANUAL is used to evaluate color fastness to Wet & Dry rubbing with strict adherence to ISO & AATCC Standards. It is very useful for Textile Colleges, Mill, & export house Labs. Amith Garments Crockmeter is completely made of mild steel duly painted. It provides 9 N load on 16 mm finger. Stroke length is 104±3 mm. All parts are meticulously designed and precisely Engineered for flawless performance & long life. 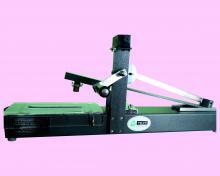 Mechanical type stroke counter is provided for counting the strokes. It is supplied with all accessories. Manual Crockmeter as per ISO & AATCC. Analog stroke counter for counting the revolutions. U shape metal specimen Holder for easy gripping samples. Special finger clip for easy fixing the crocking cloth. Standard abrasive paper (No 320 ) for accurate test result.